I know this will be a controversial post for some people. Many medical professionals do not agree with my views… which is fine because I do not agree with theirs. 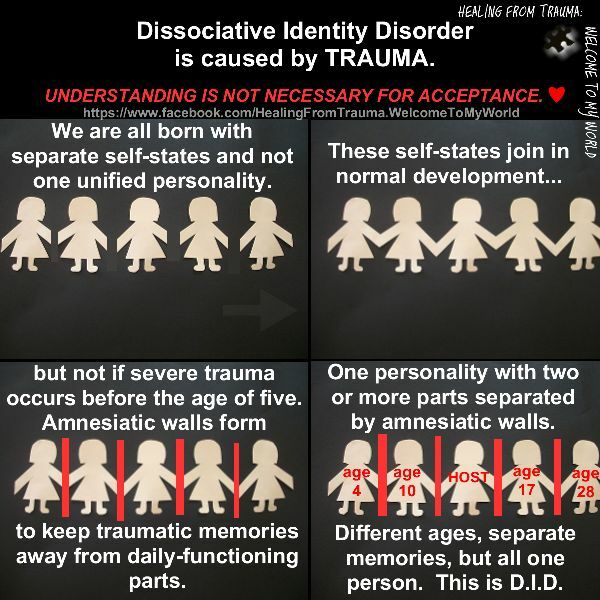 😉 Joking aside, many doctors, therapists, and even some people within the dissociative identity disorder (DID) community feel that integration is the holy grail of healing persons from DID. To me? Integration is a dirty word. Even now while writing this, I can feel my inner world starting to freak out. Anxiety, worry, a wish to run away, feeling overwhelmed, getting angry… that is what my Helpers deal with every time this word is said. I feel it too. Big time. I feel totally in control today and I am always out front when writing but I can still feel the weight of inner feelings especially when they are shaken up. Having DID is not easy. Every situation that happens garners my own emotions but then the Helpers step in with theirs as well. Have you ever been at a big get-together and try to get everyone to stop and listen to you? Can you imagine trying to come to agreements about certain important issues? There will be as many opinions as their are people. DID is a lot like that every day. That said? Some of the same people who may drive you batty would also rush to your aid if you suddenly collapsed or started having real troubles coping. DID is a lot like that too. I believe that my Helpers started coming in to existence between the ages of 2 and 4. I know for sure there were several there when I was 4 and 5 but I have a feeling they were there earlier. For me? I’ve never had a life without my Helpers in it. For the purpose of this blog, I will set aside all the confusion and thinking I saw dead people and just discuss my view since being properly diagnosed. As much as life with DID can get hectic, I am never bored and never lonely. I have company at all times and honestly? I am not sure I’d enjoy life so much without it. I was once on medication that made them almost silent (and made me a zombie) and that was a very sad and lonely time for me. I am also ALWAYS full of ideas for new things and ways to use things that I myself may have never thought of. I also have a huge issue with integrating these people whom I have come to view as such a big part of my life. Who do I get rid of first? Little “Hannah Banana”? My ever faithful sidekick Rielyn? Old man Oscar? Tilly who helped me birth a baby when I was too young to mentally handle it on my own? I am sorry but full integration is never going to happen because each of these Helpers are important to me as individuals. I am also very aware that each of them is a part of me. A very compartmentalized part of me but still essentially “me”. While it would be all neat and tidy to roll the Helpers and I in to one person, I honestly feel I would end up completely overwhelmed. At least right now there is separation between all these opinions and emotions. So what do I want? What do I feel is healthy? Rather than working on getting each Helper to integrate, I spend that time trying to work out the kinks in our relationships and certain actions. I will use Jenna as an example. She was always having issues with self harm and quite often these “events” were incredibly scary. I still have many scars. Trying to integrate her causes panic, more dissociation and more self harm. Working out a deal between us was FAR more productive. Jenna admitted in writing and through art that she often used self harm not only as a release but also in trying to fix old scars. A deal was made that if there was no self harm for 6 months, we would get a tattoo to cover one set of scars. 6 months later was another tattoo to cover more. Jenna LOVES her tattoo’s and I love them too. She found a new strength during a year of no self harming that she still possesses today. Integration made her run away and refuse help but making a deal with her stopped the harmful behavior and allowed me to take care of her. One by one, we work out deals. We make rules that certain age groups MUST follow. No one under 18 drives. No one under 18 signs important documents. Only I (Heather) goes to therapy. If anyone has a concern, they can write it down and I will take care of it or help them with it. There are a few other rules that are for safety, friendship, being creative and so forth. These rules are enough for me to feel good about my team of Helpers. There will always be mess ups, uncomfortable situations, missing time, forgotten occasions and other issues that persons with DID have but would full integration solve all of these issues? And what about all the PTSD triggers they help me through? How often I would have fled out of a movie theater, ran my car off the road at a fright, been unable to function at social events before I was able to stay more present? My life would have been far worse. I am sure of it. My Helpers came in to being for excellent reasons and I do not wish to thank them by making them null and void. Also, I am aware of 34 Helpers… integration could or would take FOREVER. I’d rather live my life with my team. They help me and I help them. For me personally? That is enough. First may I say how happy I am that Christmas is over? I know from all the emails, shares and comments to my “Trauma and Christmas” post that I am absolutely not alone. It is nice to feel less alone but also sad to know so many of us find Christmas as well as many other holidays very difficult. Did you manage to find ways to take care of yourself? Please just know that you were all in my mind. This was a really weird Christmas and New Years for me. I was struck how my thoughts and feelings were pointed one way and yet the other way all at the same time. If there is a way to go north AND south in the same moment? I did it over the past 2 weeks. One situation that came up over and over in my mind was how often the very things that I counted as my blessings were also my curses. Isn’t it strange how the same thing that makes you happy in one moment is also what makes you sad in the next? Do you find that at times? One example for me this year (and it was a big one)… my kids. On one side it was so much easier to plan for Christmas. I was able to give my husband a nice gift which never used to happen because we were always so tight to the wire with 3 children. We travelled locally when we felt like it and didn’t need to worry about rushing home to make supper or taking a child to a friend’s house. It was a much cheaper, easier, and for the lack of money only, less stressful. On the other hand? Not having them around was so hard. There were more tears than I could count and a moment of pure happiness was often followed by incredible grief. My own biological family is another example. My mother does not like me and never loved me (her exact words) so that counts her out. My father knows about and admitted to ignoring the abuse I suffered only to phone me 3 hours later calling me a sociopath and telling me that calling the cops would be a terrible idea for me. My siblings are either gone to the other side or to a life so filled with alcohol and drugs that they in any way that matters, are really gone too. … and a curse because even though I KNOW they are not good for me, that they are sick in many ways and I am better off without them in my life? I miss having my own family at Christmas more than any other time of year. Christmas is all about families, memories made now and chatting about memories from years ago. It just makes me really sad. Then there is my past. What a bang up job people did to make my life hell. My mother was the ringleader but there were hundreds upon hundreds of others that were right in there with her. Without all that abuse and those memories plus being diagnosed with DID and being treated for PTSD? I wouldn’t have this blog. I wouldn’t have the same compassion for others that I do now. I really “get it” when someone tells me that they had a hard life. I wouldn’t be running a support group and I wouldn’t have my art. All 3 began as a direct result of my past. For as much as my abuse took from me, it also made me who I am now and it is responsible for my livelihood. I know I’d have a different, maybe better life if it all had not happened but would I appreciate it as much as I do now? I doubt it. In the end it all goes back to my belief that a situation is rarely what you think it is. Your perception can cloud even the smallest issue and make it feel huge. It can work the other way too. I know when bad things happen, I usually don’t react at all. My perception due to my past is that there are FAR worse things in life. My issues lately can be seen in a good light, a bad light or both. It is all about the perception that I have that day or that moment. Maybe that is how life is really supposed to be in the first place? We never really need to label events in our life at all because our curses can also be our blessings. Some of you will recall me speaking about “Julie” in past blogs. “Julie” is my main Helper. The leader of the pack. “Julie” has decided that she no longer wishes to be called Julie. That was never her name but due to my emotional attachment to the name we bartered for a bit of time so I could get accustomed to the idea. I am very grateful for that time. It helped me a lot. That said? I must introduce you all to Rielyn. This is Helper “Julie’s” real name. Her choice. Rielyn means “Dominant Leader” which amuses me greatly. Rielyn is most certainly the dominant leader of all my Helpers. She holds a very special place in our lives and she carries a huge amount of responsibility with the precision of a military strategist. Rielyn is the only Helper that ages along with me. Everyone else stays the same age no matter how many years pass. I am not totally sure when she really came in to being but I don’t ever recall a time when she wasn’t there. Her position of power really took hold after my sister Julie died. In assuming that Rielyn was my sister Julie speaking to me from beyond the grave, I gave Rielyn A LOT of power. She has never misused that power though. She doesn’t always make the right decisions but she always makes them with the best of intentions. That is all we can ask of anyone isn’t it? Rielyn decides who comes out, when they come out and when they retreat again. If you are ever in my presence and I am hopelessly lost in a dissociation, it is Rielyn you need to speak to. I am completely unaware of anything that is going on while she watches and controls every moment. Rielyn deals with issues swiftly and powerfully. When she decides something, you are following that path. Period. You know how you could goof off in many of your school classes but there was always that one teacher who you just never messed with? Rielyn is just that sort of person. I respect that in her even if she could do a lesson or two in tactfulness just to smooth the edges a bit. For anyone unfamiliar with Dissociative Identity Disorder, most systems have a leader of some sort. Not all but most. I will try to explain what I understand about how and why DID exists in some of us. Rielyn was very likely created during a time that was just too unbearable to recall. I do think that I had several Helpers before Rielyn came along but perhaps those Helpers needed someone to run the show. Maybe they were disorganized or finding it hard to know what to do? I have no memory of this tie so I am really just guessing here but I have learned that almost every Helpers has a reason for being. Rielyn is a born leader so I believe she was created to do just that. Her place in my system is to keep everyone on track. Me included. If she sees a trigger coming or happening, she will often whisk me away before it even begins. If I am having too many nightmares, she will eventually bring in a Helpers to sleep the rest of the night for me. If I need to be alone in a place that makes me nervous, she will send out an older male. I know that Rielyn stays out of my therapy for the most part but if the therapist gets too close to something that Rielyn doesn’t feel I can handle, she will take over and steer the conversation away from that topic before sending me back in. Rielyn just knows what is needed and when so she makes it all happen. I think my biggest challenge amongst my Helpers is to get Rielyn to loosen the reins a bit and let me handle more situations on my own. It has to be hard for her after I leaned so heavily on her for so long. I guess it is a bit of a dance between us. We just need to learn the steps.